Planned Parenthood just got $500 Million in tax money to murder babies - and to promote perversion. They have always claimed that they don't use your money to abort babies. It is against federal law to use tax dollars for abortions. So OUR dollars are supposedly used for "education." But money is "fungible," meaning you can't tell where a particular dollar has been spent. So all tax dollars support PP, whose main goal is killing babies. Now we find out what the "education" dollars are used for - propaganda. Supposedly they educate women about health care. They never admit that their primary activity is abortions, but the financials prove that is the case. So it's no surprise that they use our money to talk women and girls into having abortions. 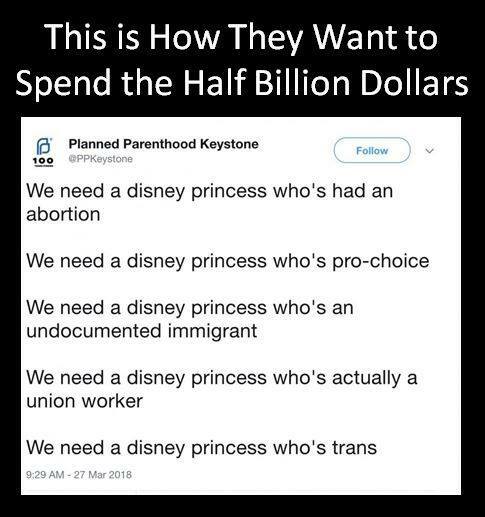 Thus their desire to have Disney create a "princess who's had an abortion," or a "princess who's pro-choice." Their lie to the federal government is that they "Empower individuals to make independent, informed decisions about their sexual and reproductive lives. We provide information and health care and promote public policies that make those services available to all." So what does national policy towards illegal aliens, unions, or transgender perversion have to do with "health care"? Obviously nothing. Yet they spend tax dollars promoting these issues. We should never forget the huge profits they make doing their evil work. They claim that due to our tax money they can provide "reduced cost" - or even "free" - services. But their own website says that they charge up to $900 for an abortion that takes a few minutes. And they charge $480 for the abortion pill.Almost $500 for a pill! We finally have a truly pro-life president. Now we need to pressure our representatives to honor their campaign pledges and defund Planned Parenthood. There is absolutely no reason why Americans - most of whom oppose abortion - should have to pay for PP's propaganda and abortions. The majority of abortions performed at their "clinics" are because the women were too lazy to use birth control. If they had to pay for their own abortions, they would be more careful - or even possibly, more moral.